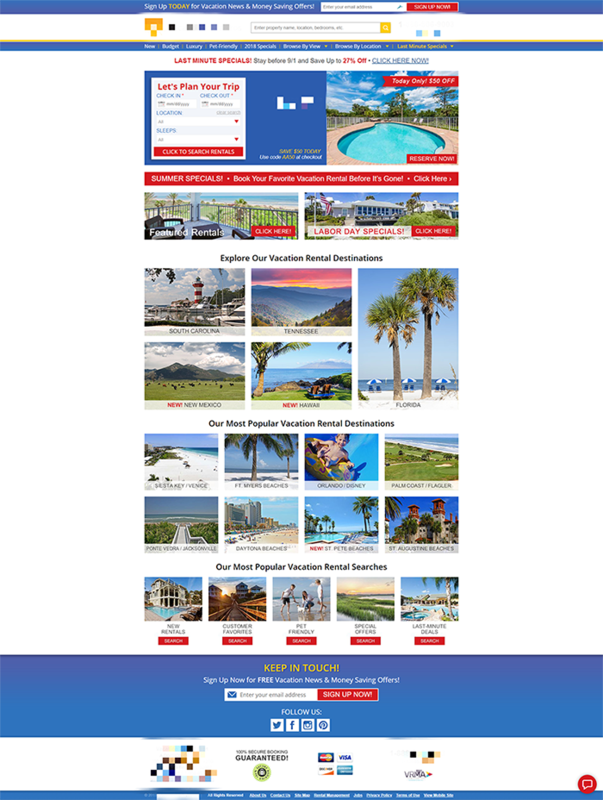 A leading custom vacation rentals platform active in 19 markets across U.S.
Our client wanted to sync data from external providers and improve the speed and reliability of its content management system (CMS), which is used by end customers to browse, search, and book rentals. Administrators use the CMS to list properties, manage site content for the primary website and various micro-sites, track audiences, administer surveys, and more. We helped improve the system to optimize the client’s conversion rate, in this case an increased reservation rate, which resulted in a faster, more sustainable and efficient site with happier users who can find what they need quickly and easily. Up and Running has played a large part in the development and expansion of a technology-enabled property management lodging platform offering exclusive vacation rentals to consumers. Our client is one of the fastest growing vacation rental management companies in North America with almost 2,000 properties under exclusive management in predominantly Sun Belt locations across the United States. The vacation rental industry has grown rapidly in recent years, with many U.S. travelers shifting away from traditional hotels and toward vacation homes. Our client saw this opportunity and has since been changing the traditional paradigm of property-centric marketing in this industry by creating a technology platform that brings together the best practices of online travel agencies and traditional vacation rental management companies. Our client owns the exclusive contracts to its properties, and, through sub-branded microsites and its main site, combines the services of traditional management companies with a technology-enabled platform that allows consumers to browse properties and book rental homes. As a result of the company’s integration platform, which we helped build, it is successfully expanding and experiencing organic growth into new markets. Windows Server is used for the application. Additionally, NGINX is configured as a load balancer to improve the server’s resource availability and efficiency. Images are hosted on Amazon’s Simple Storage System (AWS S3). To ensure that the content is delivered to end users with lower latency, Amazon CloudFront manages the domains that serve these images. Windows Virtual Machines are hosted by AWS EC2, of which the production is currently migrating dev-test and staging environments. Our testing harness utilizes xUnit and NUnit as well as New Relic to provide error and performance analytics and insights. In order to run a fully capable deployment pipeline we’ve configured TeamCity (CI) and Octopus Deploy (CD). Up and Running’s team working on this is highly experienced in .NET framework technologies across a variety of industries. This project has definitely added value for all the parties involved. Our client’s system is faster, more reliable, and resulting in greater conversion rates, and we are deepening our skillset in a booming vertical.